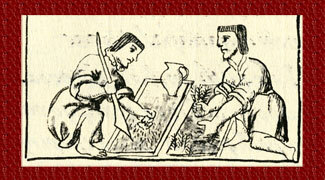 The Aztecs had developed a highly sophisticated system of medicine, in which these medicinal and useful herbs played a vital part (Burns and Arroo 2005). 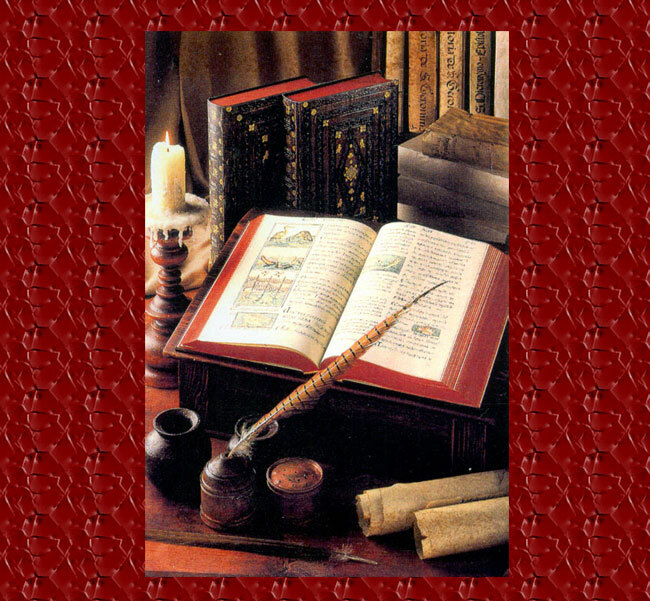 We know this because, in the wake of the Conquistadors, scholars travelled to the Americas to record the knowledge of the indigenous people in the form of codices and other documents. 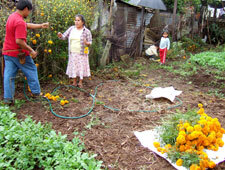 We can also see traces of traditional uses of herbs in the contemporary use of medicinal plants by Mexican communities. 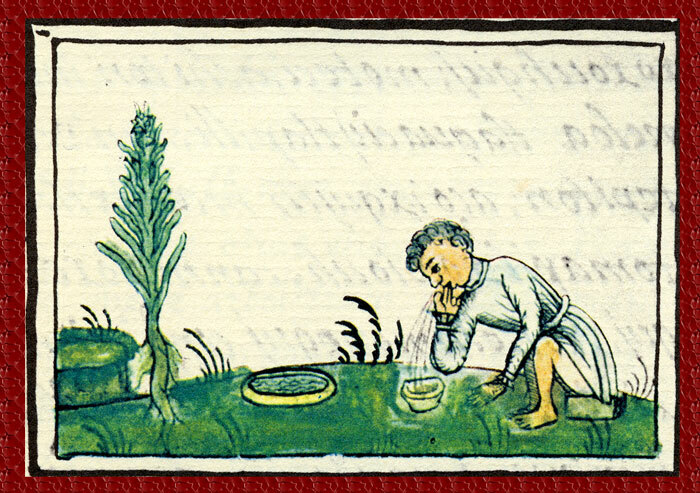 Of the surviving post-Conquest documents, one of the most attractive is probably the Libellus de Medicinalibus Indorum Herbis - also known variously as the Aztec Herbal, the Badianus Manuscript, or the Codex Barberini (de la Cruz 2000). It was written in 1552 by a young Aztec doctor, Martin de la Cruz “taught by no formal reasonings, but educated by experiments only”, and describes a number of ailments suffered by the Aztec people, together with their recommended treatments - some of which seem a little bizarre, it must be said. 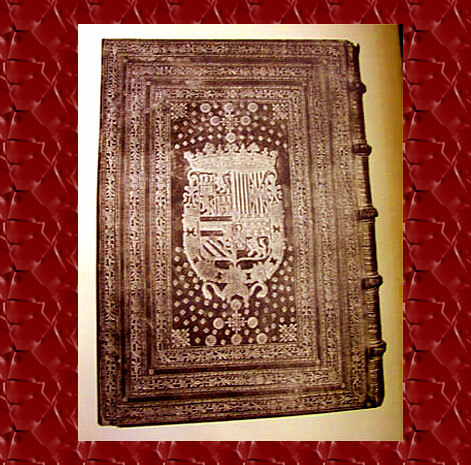 A more detailed study is found in Friar Sahagún’s 16th Century General History of the Things of New Spain(de Sahagun 1963). 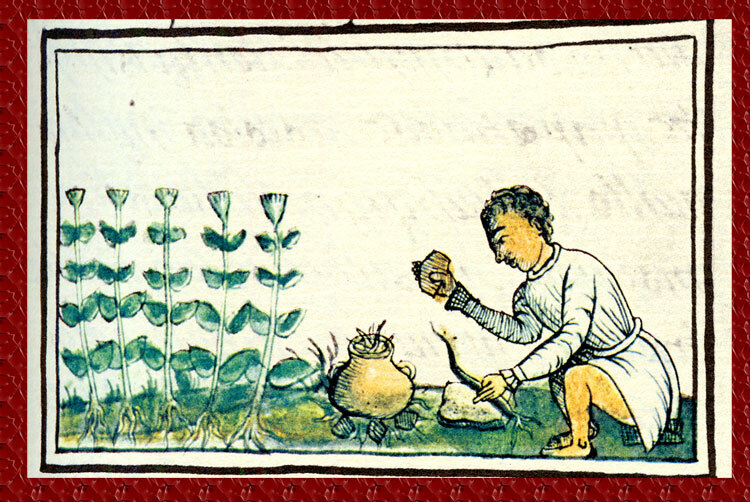 This treatise of Aztec daily life - known as the Florentine Codex - contains a book titled “Earthly Things”, of which a large section is devoted to the medicinal herbs. 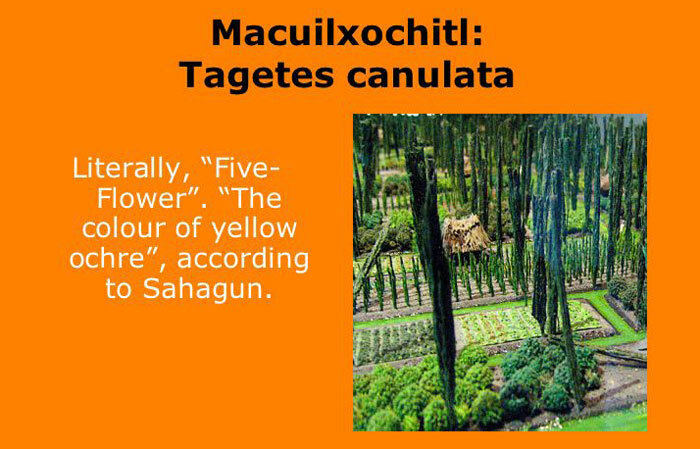 Sahagúns’ text is considered to present a more authentic picture of genuine Aztec medicine than de la Cruz’ Aztec Herbal, because the latter had perhaps been “contaminated” by Spanish influences. 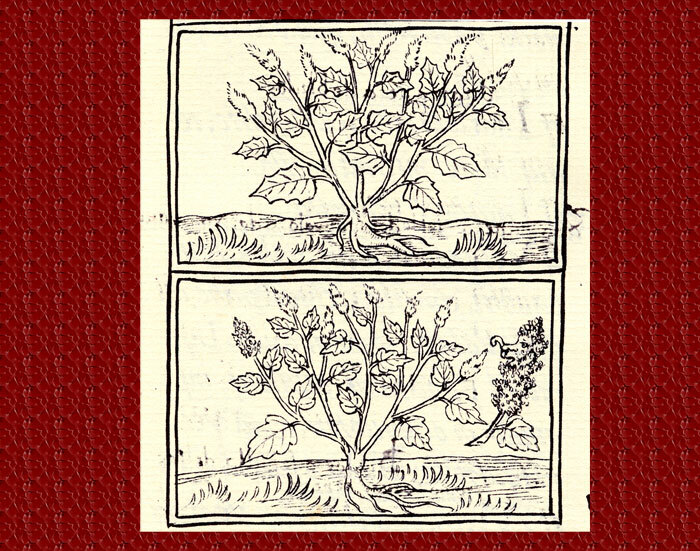 We also have Hernandez’ Rerum Medicarum Novae Hispaniae Thesaurus, covering over a thousand medicinal plants, and described in detail in Professor Ortiz de Montallano’s introduction to this section. 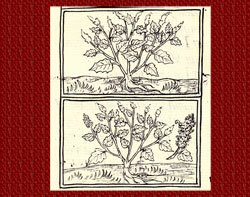 Together, these documents describe a number of plants that are well known to us today as foodstuffs - vanilla, tomato, and guava, for example - and others that we know as ornamental flowers, such as types of magnolia and frangipani. The books give us botanical descriptions of the plants, details of how the Aztecs prepared them, and tell us which ailments were treated with them. 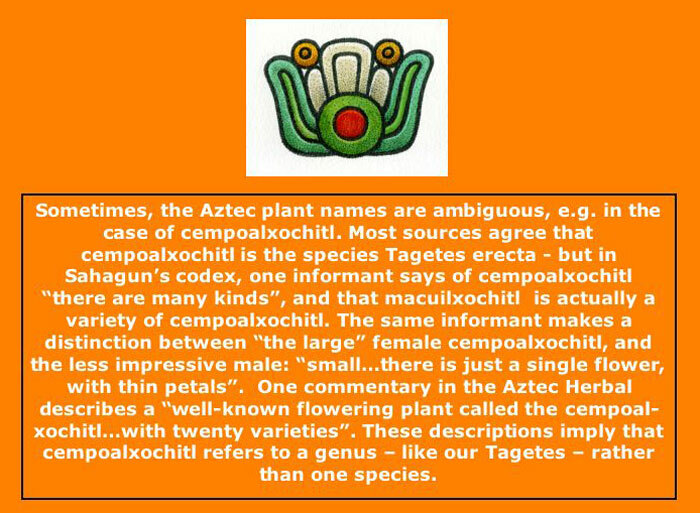 In this review I’d like to discuss the medicinal properties of a group of flowers that, although commonplace to us, actually held a central place in the Aztec world, being both sacred herbs of Tlaloc, and enormously important medicines. These are the flowers of the Tagetes genus: marigolds, to you and me. 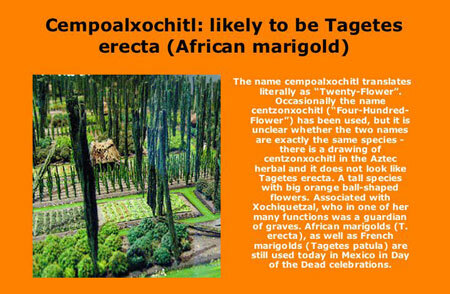 You probably have at least one marigold in your garden; maybe the popular small “French marigold”, Tagetes patula, or its bigger cousin, Tagetes erecta. 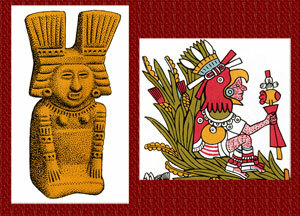 There are lots of types, and most of them were actually first developed by the Aztecs. c) remember that the levels of active compounds in plants can vary depending on the climate in which the plant was grown. 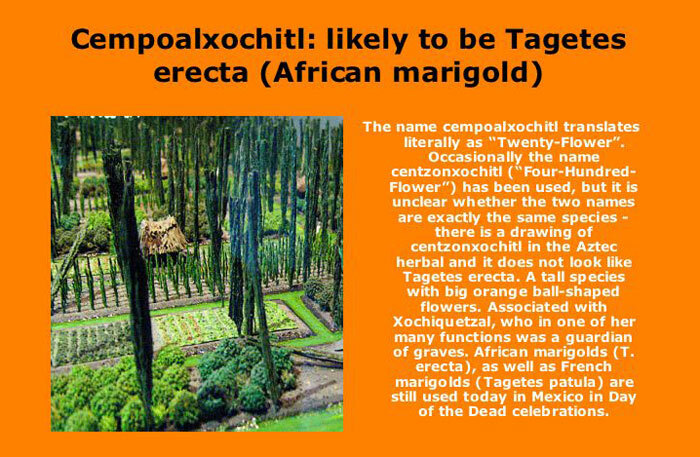 To be completely accurate, we would need to obtain herbal material that was grown under the exact conditions (rainfall, sunlight, altitude and soil) that the Aztecs grew it. Clearly that’s not really possible. 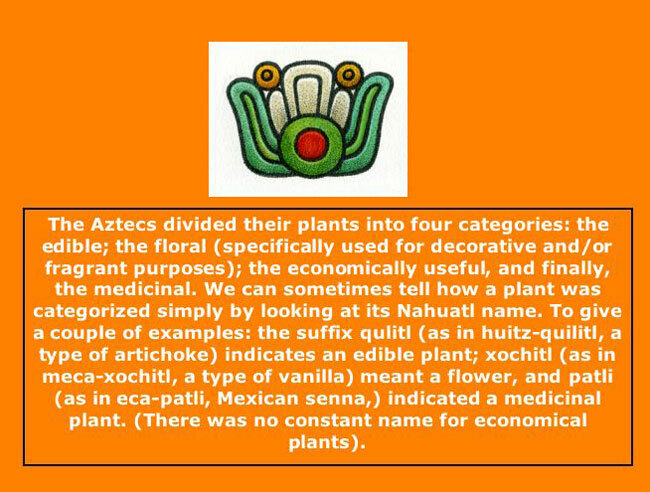 Finally, we could look at how the plants are used today, by the modern-day Nahua and other indigenous Mexican peoples. So although we can’t directly test Aztec remedies, we can copy them as far as possible, and make a confident guess based on our own test results and literature. 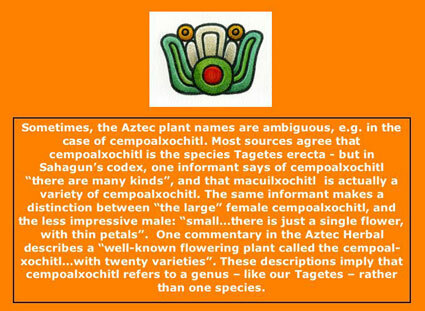 So how were Yauhtli and Cempoalxochitl used by the Aztecs? The Aztecs divided diseases into those caused by an excess of heat (with associated dryness), or those caused by an excess of cold (with associated dampness or excess fluid in the body). 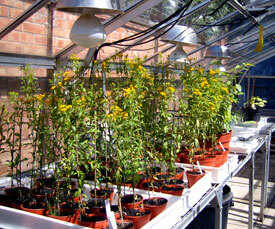 There’s a recurring theme with Tagetes - they were used to treat “cold” diseases. Cold diseases tended to be those that were imagined to be linked with water, or an excess of cold air. They were phlegmy, rheumy, even feverish diseases - because fever actually can produce feelings of “chills” - and those ailments that involve swelling of parts of the body. 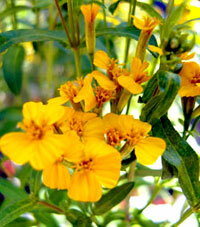 Tagetes were seen as “hot” plants, and used to expel excess cold and fluid from the body. 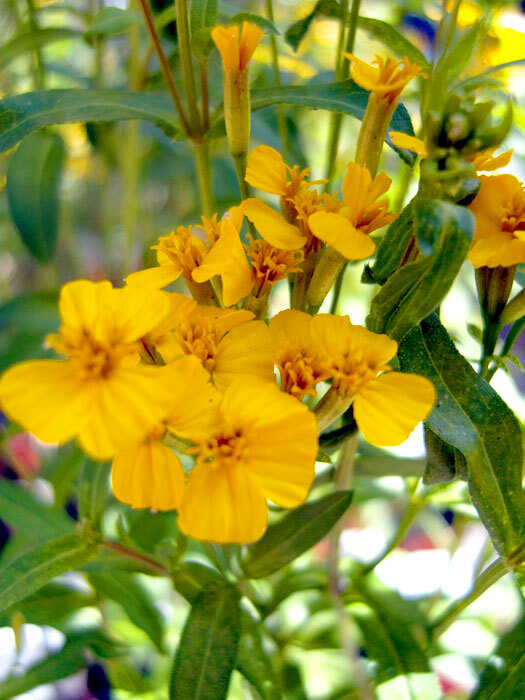 We can see this in Sahagún’s description of the use of Tagetes lucida: “it is an ejector of humors, it is a medicine... one who has chills drinks [an infusion of it]. It is rubbed in the hands with water. And with it there is incensing, and there is washing.” Ortiz de Montellano, in his “Aztec Medicine, Health and Nutrition” (Ortiz de Montellano 1990), lists a number of symptoms which were relieved with Tagetes lucida, dividing the causative illnesses into those caused by “phlegm” (recurrent intermittent fevers, for example); those with partly “divine” causes (gout, stiffness, spitting of blood), and those with “natural” causes (swellings and blisters, digestive ailments). 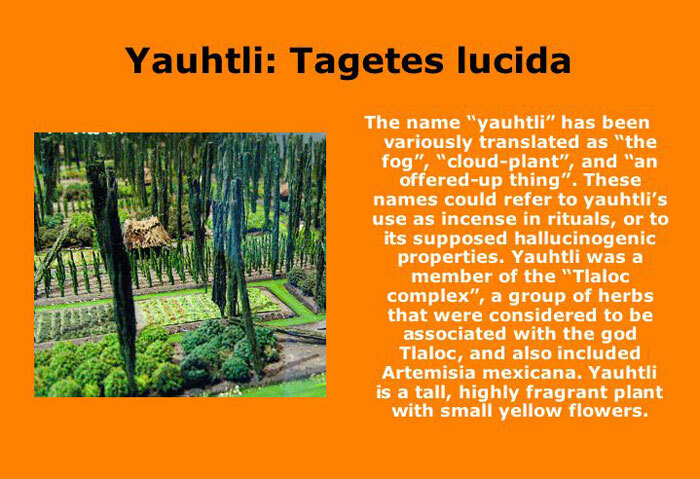 Whilst not being strictly a medical use, it is worth mentioning that powdered Tagetes lucida was also administered to certain sacrificial victims, with the dual intention of inducing both anaesthetic and hallucinogenic effects. These are described less frequently in the codices than T. lucida, but their usefulness is not in doubt. Ortiz de Montellano identified cempoalxochitl’s uses as, again, those linked to cold, phlegmy diseases: fever, excess phlegm, dropsy. 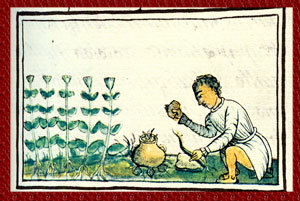 Centzonxochitl is described in the Aztec Herbal as to be extracted in ‘bitter water’ for the treatment of certain fevers - those with such symptoms as blanching, turning red, spitting blood and jerking the limbs - and it is also used, again in bitter water, to wash out the uterus of women entering labour - perhaps to prevent infection. These plants contain a number of bioactive compounds; notably flavonoids. Flavonoids constitute a large group of natural compounds, with an array of pharmacological activities. Notably, we find patuletin, which has been found, in laboratory tests, to reduce oedema and relieve symptoms of rheumatoid arthritis (Li, Mao et al. 1991). It’s also an anti-spasmodic. We also find quercetagetin, an antibacterial (Harborne and Baxter 1983), and a related compound, quercetagritin, with antiviral activity. These quercetin-derived flavonoids are also frequently diuretics, and flavonoids in general are frequently diaphoretic (meaning that they help to reduce fever) and anti-inflammatory (Evans 2001). 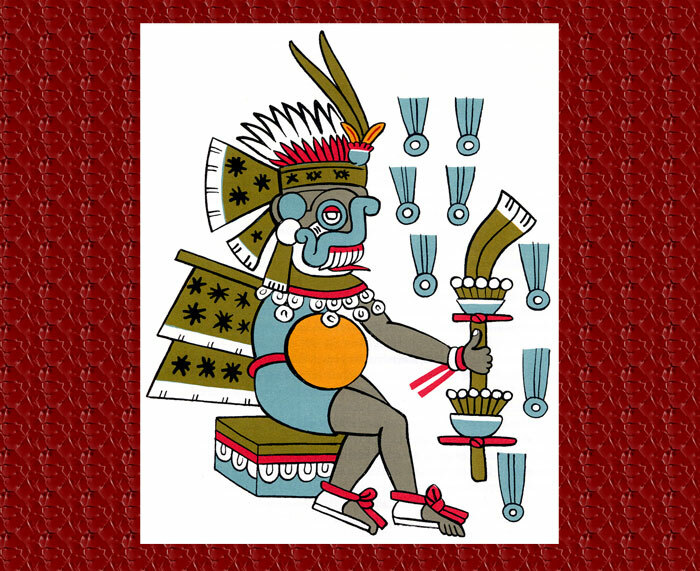 If the Aztec preparations contained sufficient levels of these compounds, it is possible that the desired physiological effects would have been brought about - “excess fluid” would have been removed by urination, fever and swelling reduced, and possibly, any underlying infection treated. 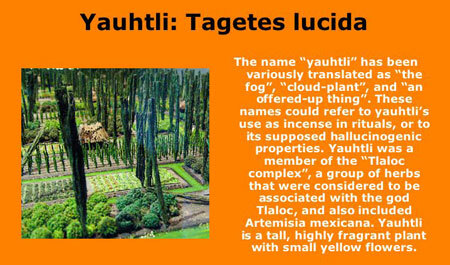 It is more likely that yauhtli has no real effects on the mind, and that religious associations were the reason for its use in sacrificial ritual. In addition to the abovementioned compounds, the genus Tagetes is rich in thiophenes, carotenoids and xanthophylls, as well as smaller levels of terpenes, ketones and other types of active chemicals. 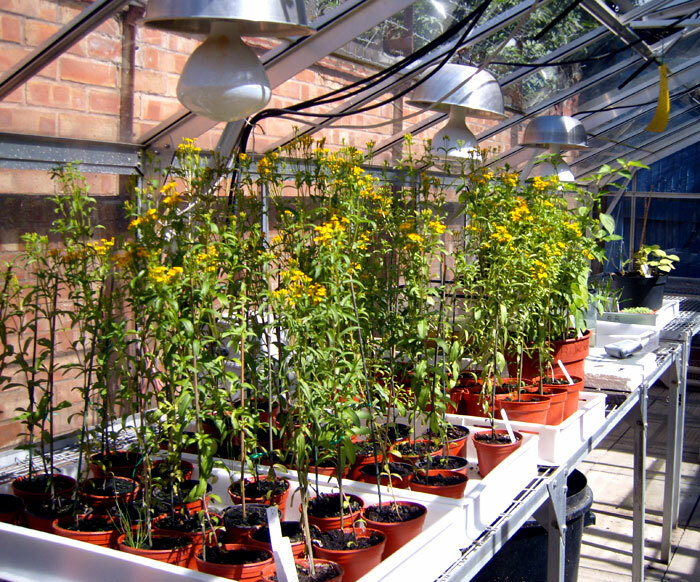 Each of these classes of chemical can be active, but testing of these compounds in Tagetes species has been limited - with the exception of thiophenes, which have been found to be extremely effective at destroying nematode infestations (Arroo, Jacobs et al. 1995). b) more commonly, with the flavonoid molecule attached to a sugar molecule. If the flavonoid occurs alone, not attached to a sugar, we call it an aglycone. Patuletin and quercetagetin are aglycones. If it is attached to a sugar, we call it a glycoside - quercetagritin is a glycoside of quercetagetin. All flavonoids can be extracted to some extent in water, but flavonoids in their glycoside form are more soluble in water, particularly so in a hot water infusion, such as that used to prepare Tagetes lucida. 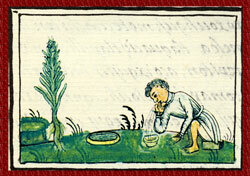 It is interesting that “bitter” water was used to extract centzonxochitl. If we assume that this bitterness indicates alkaline water (i.e. with a pH greater than 7), then we can - very tentatively - suggest that the Aztecs were modifying the compounds by the process of extraction. Alkali solvents can be used to break away the sugar bit from a glycoside, forming the aglycone. But quite a strong alkali solvent would be needed for this to happen. And we do know that a certain subclass of flavonoids - the flavanones - change their chemical structure in alkali to become their isomers, the chalcones. What we don’t know is whether this would change the medicinal properties of the extract. It is more likely that removing the sugar group would make the extract a bit more potent. When Tagetes lucida was administered to sacrificial victims, it was as a powder of dried herb, which would be blown into the face of the intended victim. It is not especially likely that this is an effective way of administering the drug. In a review of the ethnobotanical uses of Tagetes, Neher(Neher 1968) actually was brave (or daft) enough to try this on himself: he reported that the only effect was to be “extremely irritating to the mucus membranes of the mouth and throat”. (Note: please don’t attempt to do this: you may injure yourself). 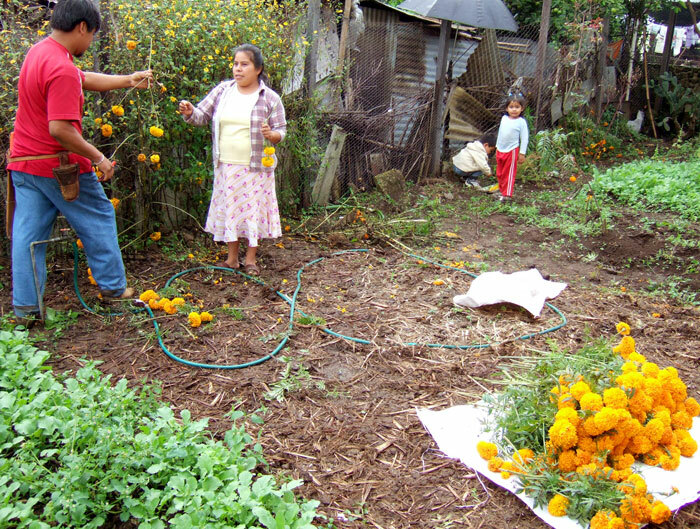 These herbs remain popular amongst cuanderos in Mexico (Frei, Baltisberger et al. 1998), and amongst communities in much of Central and South America. They’re generally used in the treatment of gastrointestinal ailments (Heinrich, Robles et al. 1998), and respiratory diseases (Heinrich, Ankli et al. 1998)., but have found usage in a wide range of illness, ranging from malaria to the treatment of “culture-bound syndromes”. A number of ethnopharmacologists - researchers who specialise in studying traditional medicines - have confirmed strong antibacterial activity of extracts of these herbs, and have begun to ascribe this activity to certain compounds. The plants are also being investigated for potential use in other illnesses, especially those with an element of inflammation. This ethnobotanical work is one of the most exciting areas of phytochemistry. 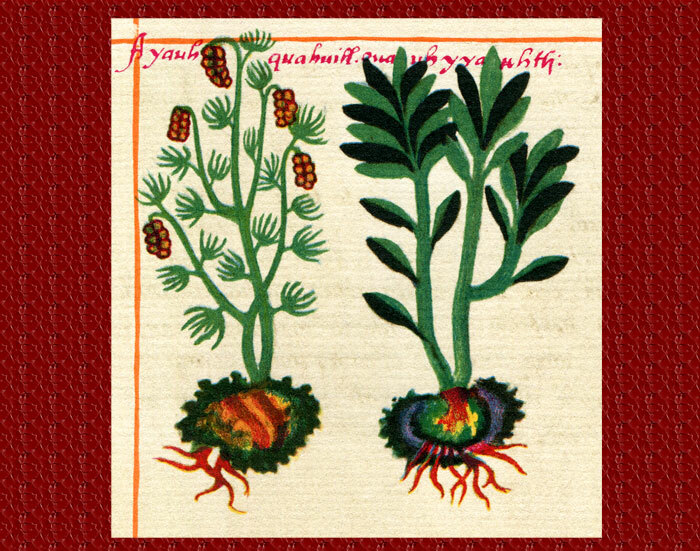 The concept of Aztec medicine, herbal and otherwise, is enormously complex and includes religious and ritual elements as well as the physiological. Here we have focused purely on the herbal aspects. 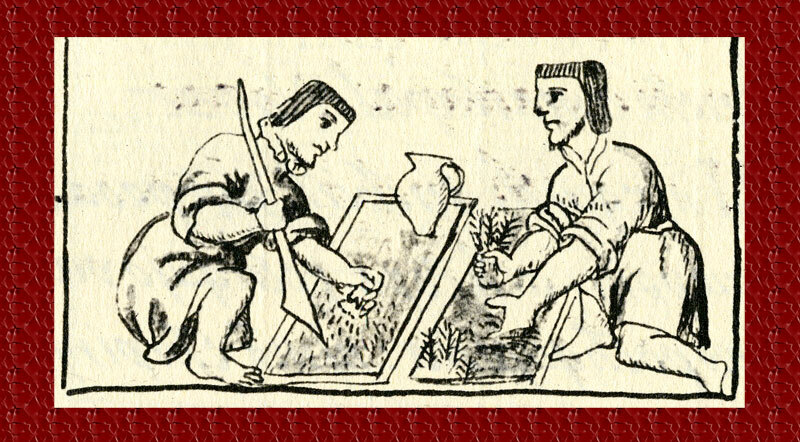 For more information on Aztec medicine in general, there is an excellent review online - “Aztec Medicine”, by Francisco Guerra, which gives more detail on all aspects of the Aztec approach to healthcare (link below). And keep an eye on this page! • Arroo, R. R. J., J. J. M. R. Jacobs, et al. (1995). 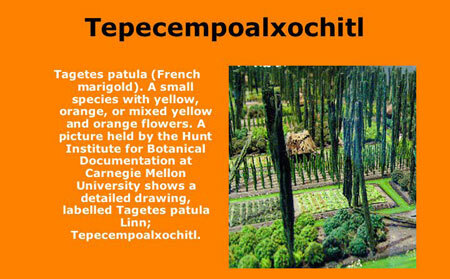 “Thiophene interconversions in Tagetes patula hairy-root cultures.” Phytochemistry 38(5): 1193-1197. • Bicchi, C., M. Fresia, et al. (1997). “Constituents of Tagetes lucida Cav. ssp. lucida essential oil.” Flavour and Fragrance Journal 12: 47-52. • Burns, C. and R. Arroo (2005). 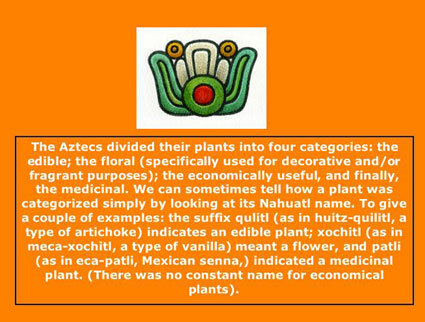 “Herbal Medicine, Aztec Style.” Herbs 30(3): 8-9. • de la Cruz, M. (2000). 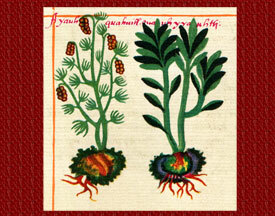 An Aztec Herbal: The Classic Codex of 1552, Dover Publications Inc.
• de Sahagun, B. (1963). 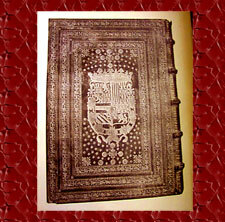 Fifth chapter, which telleth of the medicinal herbs and of the different herbs. Book 11: Earthly Things. 11. • Diaz, B. (1963). The Conquest of New Spain. London, Penguin Classics. • Evans, W. C. (2001). Trease & Evans’ Pharmacognosy Edinburgh, W.B. Saunders. • Frei, B., M. Baltisberger, et al. (1998). “Medical Ethnobotany of the Zapotecs of the Isthmus-Sierra (Oaxaca, Mexico): Documentation and assessment of indigenous uses.” J Ethnopharmacol 62: 149-165. • Harborne, J. B. and H. Baxter (1983). Phytochemical Dictionary. A Handbook of Bioactive Compounds from Plants. London, Taylor & Frost. • Heinrich, M., A. Ankli, et al. (1998). “Medicinal Plants in Mexico: Healers’ Consensus and Cultural Importance.” Soc. Sci. Med. 47(11): 1859-1871. • Heinrich, M., M. Robles, et al. (1998). 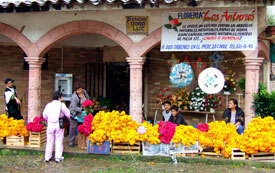 “Ethnopharmacology of Mexican Asteraceae (Compositae).” Annu. Rev. Pharmacol. Toxicol. 38: 539-565. • Li, S., W. Mao, et al. (1991). “Inhibition of rat lens aldose reductase by quercetagetin and patuletin.” Yan Ke Xue Bao 31(2): 193-208. • Neher, R. T. (1968). “The Ethnobotany of Tagetes.” Economic Botany 21-22: 317-325. • Ortiz de Montellano, B. R. (1990). Aztec Medicine, Health and Nutrition, Rutgers University Press. • Aztec Flower calendar glyph by Felipe Dávalos/Mexicolore. Excellente article, I loved it. Congratulations!